A lot of sandwich shops have popped up in SF over the past few years, but when you look at the menus it’s clear the days of the traditional deli sandwich are gone. When I was growing up there were delis on every corner; places where a person could get a simple sandwich on a locally baked sourdough roll, with a side of potato salad, deviled egg, and an enormous sour pickle. Though I still see them around, there seem to be fewer every year. 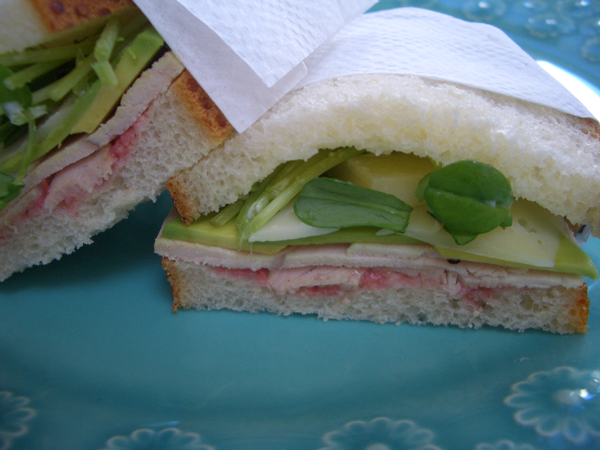 If I have the stamina for the trip across town and the hoards of people on line, I might indulge in Lucca Delicatessen where they still make one of the best deli-style sandwiches in the world. Our favorite go-to sandwich place in the neighborhood for years was Estela’s on Fillmore and Haight, but last year they and a number of other businesses and homes were destroyed by a fire. 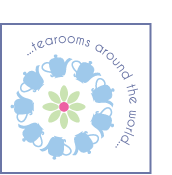 They’ve since reopened downtown and though we intend to find the time to go there, the location isn’t as geographically sound for us as it once was. 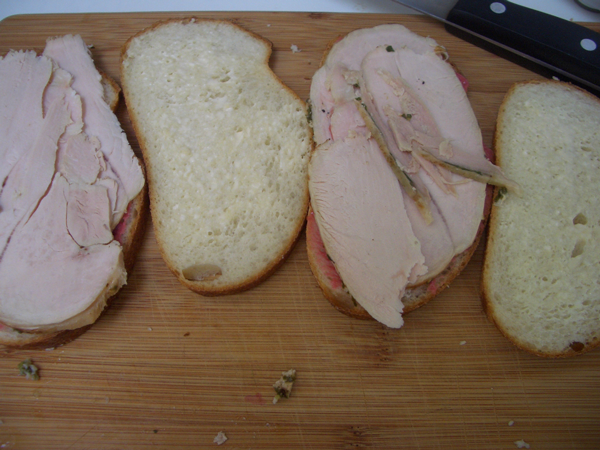 This is an homage to their “House Built” roasted turkey sandwich, and probably my favorite sandwich of all time. 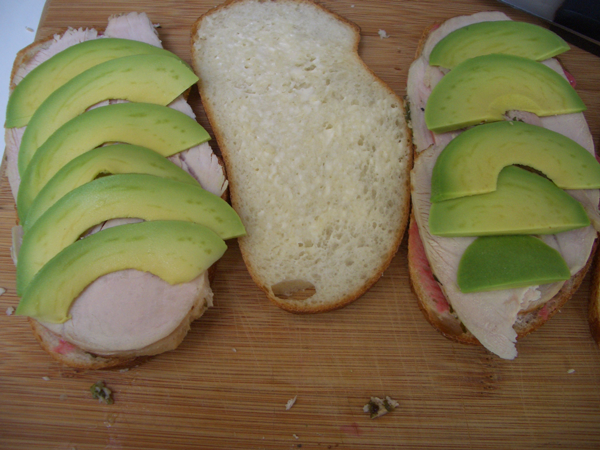 This isn’t a delicate sandwich, so we’re leaving the crusts on this time, but you can always wrap a napkin around the halves to make it a bit more user friendly for polite company. 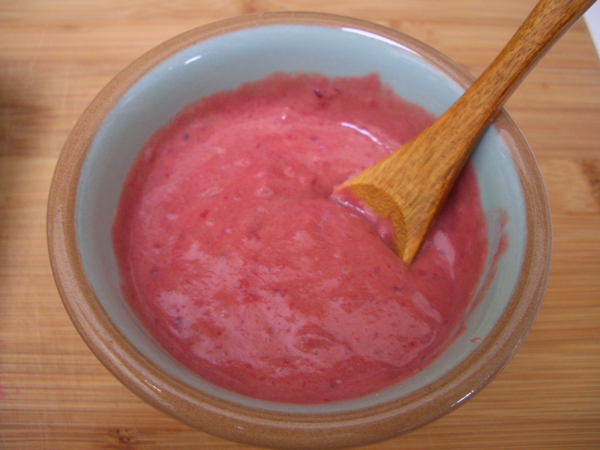 To make the cranberry mustard, blend the Dijon and cranberry sauce in a food processor or blender until smooth. 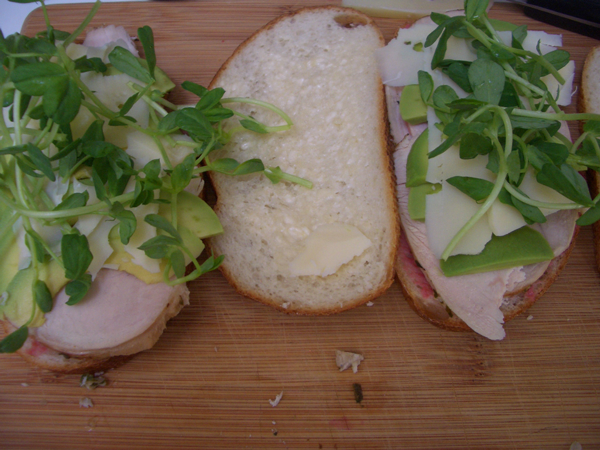 You can add more mustard or cranberry if you prefer a different ratio. It’s important to be able to taste the cranberry. 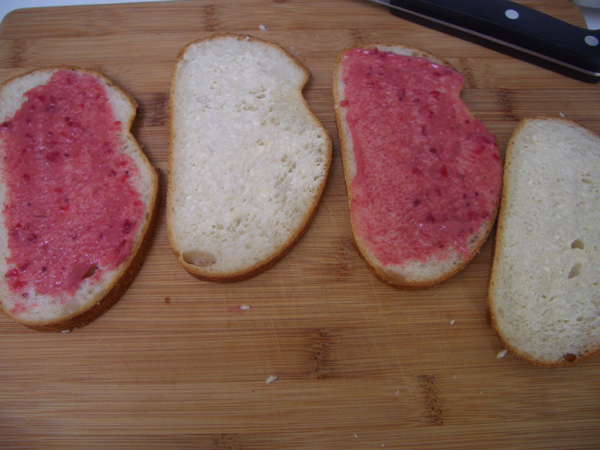 Take two slices of bread, spread one with mayonnaise and one with cranberry mustard. 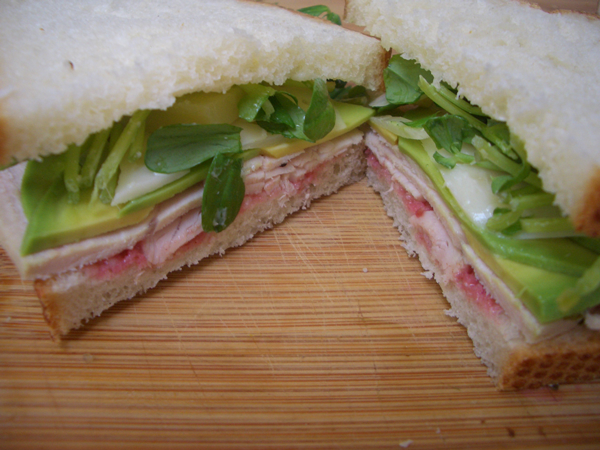 Add a layer of turkey, avocado, cheese and greens. Press the two halves together and cut—or don’t cut—as you like.